"Genera" redirects here. For the operating system, see Genera (operating system). For other uses, see Genus (disambiguation). A genus ( /ˈdʒiːnəs/ , pl. genera /ˈdʒɛnərə/ ) is a taxonomic rank used in the biological classification of living and fossil organisms, as well as viruses,  in biology. In the hierarchy of biological classification, genus comes above species and below family. In binomial nomenclature, the genus name forms the first part of the binomial species name for each species within the genus. In biology, taxonomy is the science of defining and naming groups of biological organisms on the basis of shared characteristics. Organisms are grouped together into taxa and these groups are given a taxonomic rank; groups of a given rank can be aggregated to form a super-group of higher rank, thus creating a taxonomic hierarchy. The principal ranks in modern use are domain, kingdom, phylum, class, order, family, genus, and species. The Swedish botanist Carl Linnaeus is regarded as the father of taxonomy, as he developed a system known as Linnaean taxonomy for categorizing organisms and binomial nomenclature for naming organisms. A fossil is any preserved remains, impression, or trace of any once-living thing from a past geological age. Examples include bones, shells, exoskeletons, stone imprints of animals or microbes, objects preserved in amber, hair, petrified wood, oil, coal, and DNA remnants. 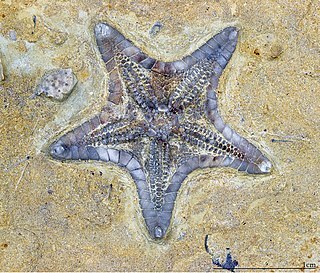 The totality of fossils is known as the fossil record. In biology, an organism is any individual entity that exhibits the properties of life. It is a synonym for "life form". E.g. Panthera leo (lion) and Panthera onca (jaguar) are two species within the genus Panthera . Panthera is a genus within the family Felidae. monophyly – all descendants of an ancestral taxon are grouped together (i.e. phylogenetic analysis should clearly demonstrate both monophyly and validity as a separate lineage  ). Carl Linnaeus, also known after his ennoblement as Carl von Linné, was a Swedish botanist, physician, and zoologist who formalised binomial nomenclature, the modern system of naming organisms. He is known as the "father of modern taxonomy". Many of his writings were in Latin, and his name is rendered in Latin as Carolus Linnæus. Species Plantarum is a book by Carl Linnaeus, originally published in 1753, which lists every species of plant known at the time, classified into genera. It is the first work to consistently apply binomial names and was the starting point for the naming of plants. Binomial nomenclature, also called binominal nomenclature or binary nomenclature, is a formal system of naming species of living things by giving each a name composed of two parts, both of which use Latin grammatical forms, although they can be based on words from other languages. 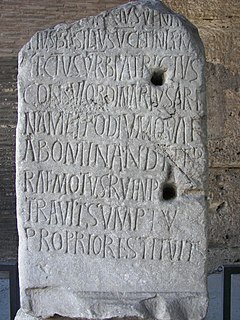 Such a name is called a binomial name, a binomen, binominal name or a scientific name; more informally it is also called a Latin name. The first part of the name – the generic name – identifies the genus to which the species belongs, while the second part – the specific name or specific epithet – identifies the species within the genus. For example, humans belong to the genus Homo and within this genus to the species Homo sapiens. Tyrannosaurus rex is probably the most widely known binomial. The formal introduction of this system of naming species is credited to Carl Linnaeus, effectively beginning with his work Species Plantarum in 1753. But Gaspard Bauhin, in as early as 1623, had introduced in his book Pinax theatri botanici many names of genera that were later adopted by Linnaeus. In zoological nomenclature, the specific name is the second part within the scientific name of a species. The first part of the name of a species is the name of the genus or the generic name. The rules and regulations governing the giving of a new species name are explained in the article species description. Algae is an informal term for a large, diverse group of photosynthetic eukaryotic organisms that are not necessarily closely related, and is thus polyphyletic. Including organisms ranging from unicellular microalgae genera, such as Chlorella and the diatoms, to multicellular forms, such as the giant kelp, a large brown alga which may grow up to 50 m in length. Most are aquatic and autotrophic and lack many of the distinct cell and tissue types, such as stomata, xylem, and phloem, which are found in land plants. The largest and most complex marine algae are called seaweeds, while the most complex freshwater forms are the Charophyta, a division of green algae which includes, for example, Spirogyra and the stoneworts. 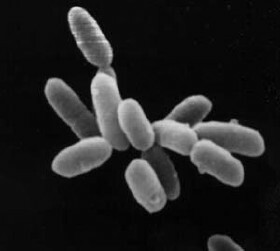 Archaea constitute a domain of single-celled microorganisms. 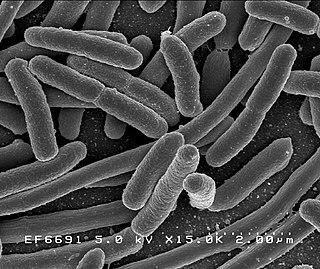 These microbes are prokaryotes, meaning they have no cell nucleus. Archaea were initially classified as bacteria, receiving the name archaebacteria, but this classification is outdated. Except for viruses, the standard format for a species name comprises the generic name, indicating the genus to which the species belongs, followed by the specific epithet, which (within that genus) is unique to the species. For example, the gray wolf's scientific name is Canis lupus, with Canis (Lat. "dog") being the generic name shared by the wolf's close relatives and lupus (Lat. "wolf") being the specific name particular to the wolf. A botanical example would be Hibiscus arnottianus , a particular species of the genus Hibiscus native to Hawaii. The specific name is written in lower-case and may be followed by subspecies names in zoology or a variety of infraspecific names in botany. The scientific names of virus species are descriptive, not binomial in form, and may or may not incorporate an indication of their containing genus; for example the virus species "Salmonid herpesvirus 1", "Salmonid herpesvirus 2" and "Salmonid herpesvirus 3" are all within the genus Salmonivirus , however the genus to which the species with the formal names "Everglades virus" and "Ross River virus" are assigned is Alphavirus . In botany, similar concepts exist but with different labels. The botanical equivalent of zoology's "available name" is a validly published name. An invalidly published name is a nomen invalidum or nom. inval. ; a rejected name is a nomen rejiciendum or nom. rej. ; a later homonym of a validly published name is a nomen illegitimum or nom. illeg. ; for a full list refer the International Code of Nomenclature for algae, fungi, and plants (ICNafp) and the work cited above by Hawksworth, 2010. In place of the "valid taxon" in zoology, the nearest equivalent in botany is "correct name" or "current name" which can, again, differ or change with alternative taxonomic treatments or new information that results in previously accepted genera being combined or split. An available (zoological) or validly published (botanical) name that has been historically applied to a genus but is not regarded as the accepted (current/valid) name for the taxon is termed a synonym ; some authors also include unavailable names in lists of synonyms as well as available names, such as misspellings, names previously published without fulfilling all of the requirements of the relevant nomenclatural Code, and rejected or suppressed names. The numbers of either accepted, or all published genus names is not known precisely although the latter value has been estimated by Rees et al., 2017  at approximately 510,000 as at end 2016, increasing at some 2,500 per year. "Official" registers of taxon names at all ranks, including genera, exist for a few groups only such as viruses  and prokaryotes,  while for others there are compendia with no "official" standing such as Index Fungorum for Fungi,  Index Nominum Algarum  and AlgaeBase  for algae, Index Nominum Genericorum  and the International Plant Names Index  for plants in general, and ferns through angiosperms, respectively, and Nomenclator Zoologicus  and the Index to Organism Names  for zoological names. A deduplicated list of genus names covering all taxonomic groups, compiled from resources such as the above as well as other literature sources, created as the "Interim Register of Marine and Nonmarine Genera" (IRMNG), is estimated to contain around 95% of all published names at generic level, and lists approximately 490,100 genus names in its March 2019 release;  of these, approx. 265,500 are presently flagged "accepted" (including both extant and fossil taxa), 127,500 as unaccepted for a range of reasons, and an additional 126,000 not yet assessed for taxonomic status. Included in the 265,500 accepted, extant plus fossil genus names in the March 2019 edition of IRMNG are 188,158 genera of animals (kingdom Animalia), 21,935 Plantae (land plants and non-Chromistan algae), 10,231 Fungi, 9,989 Chromista, 1,963 Protozoa, 3,387 Prokaryotes (3,247 Bacteria plus 140 Archaea) and 851 Viruses, although totals for some eukaryote groups will be an underestimate since the present "uncertain" (=unassessed) category (which contains largely animal and protozoan genus names) contains a mix of names that should ultimately be allocated either to "accepted" and "unaccepted" upon further investigation. By comparison, the 2018 annual edition of the Catalogue of Life (estimated >90% complete, for extant species in the main) contains currently 175,363 "accepted" genus names for 1,744,204 living and 59,284 extinct species,  also including genus names only (no species) for some groups. the particular form of biological classification (taxonomy) set up by Carl Linnaeus, as set forth in his Systema Naturae (1735) and subsequent works. In the taxonomy of Linnaeus there are three kingdoms, divided into classes, and they, in turn, into orders, genera, and species, with an additional rank lower than species. a term for rank-based classification of organisms, in general. That is, taxonomy in the traditional sense of the word: rank-based scientific classification. This term is especially used as opposed to cladistic systematics, which groups organisms into clades. It is attributed to Linnaeus, although he neither invented the concept of ranked classification nor gave it its present form. In fact, it does not have an exact present form, as "Linnaean taxonomy" as such does not really exist: it is a collective (abstracting) term for what actually are several separate fields, which use similar approaches. In biology, a type is a particular specimen of an organism to which the scientific name of that organism is formally attached. In other words, a type is an example that serves to anchor or centralize the defining features of that particular taxon. In older usage, a type was a taxon rather than a specimen. A botanical name is a formal scientific name conforming to the International Code of Nomenclature for algae, fungi, and plants (ICN) and, if it concerns a plant cultigen, the additional cultivar or Group epithets must conform to the International Code of Nomenclature for Cultivated Plants (ICNCP). The code of nomenclature covers "all organisms traditionally treated as algae, fungi, or plants, whether fossil or non-fossil, including blue-green algae (Cyanobacteria), chytrids, oomycetes, slime moulds and photosynthetic protists with their taxonomically related non-photosynthetic groups ." A tautonym is a scientific name of a species in which both parts of the name have the same spelling, for example Rattus rattus. The first part of the name is the name of the genus and the second part is referred to as the specific epithet in the International Code of Nomenclature for algae, fungi, and plants and the specific name in the International Code of Zoological Nomenclature. Botanical nomenclature is the formal, scientific naming of plants. It is related to, but distinct from taxonomy. Plant taxonomy is concerned with grouping and classifying plants; botanical nomenclature then provides names for the results of this process. The starting point for modern botanical nomenclature is Linnaeus' Species Plantarum of 1753. Botanical nomenclature is governed by the International Code of Nomenclature for algae, fungi, and plants (ICN), which replaces the International Code of Botanical Nomenclature (ICBN). Fossil plants are also covered by the code of nomenclature. Nomenclature codes or codes of nomenclature are the various rulebooks that govern biological taxonomic nomenclature, each in their own broad field of organisms. To an end-user who only deals with names of species, with some awareness that species are assignable to families, it may not be noticeable that there is more than one code, but beyond this basic level these are rather different in the way they work. In botany, the correct name according to the International Code of Nomenclature for algae, fungi, and plants (ICN) is the one and only botanical name that is to be used for a particular taxon, when that taxon has a particular circumscription, position and rank. Determining whether a name is correct is a complex procedure. The name must be validly published, a process which is defined in no less than 16 Articles of the ICN. It must also be "legitimate", which imposes some further requirements. If there are two or more legitimate names for the same taxon, then the correct name is the one which has priority, i.e. it was published earliest, although names may be conserved if they have been very widely used. Validly published names other than the correct name are called synonyms. Since taxonomists may disagree as to the circumscription, position or rank of a taxon, there can be more than one correct name for a particular plant. These may also be called synonyms. In botanical nomenclature, author citation refers to citing the person or group of people who validly published a botanical name, i.e. who first published the name while fulfilling the formal requirements as specified by the International Code of Nomenclature for algae, fungi, and plants (ICN). In cases where a species is no longer in its original generic placement, both the author(s) of the original genus placement and those of the new combination are given. In zoological nomenclature, the valid name of a taxon is the zoological name that is to be used for that taxon following the rules in the International Code of Zoological Nomenclature (ICZN). In other words: a valid name is the correct zoological name of a taxon. In biology, a homonym is a name for a taxon that is identical in spelling to another such name, that belongs to a different taxon. A conserved name or nomen conservandum is a scientific name that has specific nomenclatural protection. Nomen conservandum is a Latin term, meaning "a name to be conserved". The terms are often used interchangeably, such as by the International Code of Nomenclature for Algae, Fungi, and Plants (ICN), while the International Code of Zoological Nomenclature favours the term "conserved name". In botanical nomenclature, autonyms are automatically created names, as regulated by the International Code of Nomenclature for algae, fungi, and plants that are created for certain subdivisions of genera and species, those that include the type of the genus or species. An autonym might not be mentioned in the publication that creates it as a side-effect. Autonyms "repeat unaltered" the genus name or species epithet of the taxon being subdivided, and no other name for that same subdivision is validly published. For example, Rubus subgenus Eubatus is not validly published, and the subgenus is known as Rubus subgen. Rubus. In scientific nomenclature, a synonym is a scientific name that applies to a taxon that (now) goes by a different scientific name, although the term is used somewhat differently in the zoological code of nomenclature. For example, Linnaeus was the first to give a scientific name to the Norway spruce, which he called Pinus abies. This name is no longer in use: it is now a synonym of the current scientific name, Picea abies. In biological classification, taxonomic rank is the relative level of a group of organisms in a taxonomic hierarchy. Examples of taxonomic ranks are species, genus, family, order, class, phylum, kingdom, domain, etc. The World Register of Marine Species (WoRMS) is a taxonomic database that aims to provide an authoritative and comprehensive list of names of marine organisms. This is a list of terms and symbols used in scientific names for organisms, and in describing the names. For proper parts of the names themselves, see glossary of scientific names. Note that many of the abbreviations are used with or without a stop. The Interim Register of Marine and Nonmarine Genera (IRMNG) is a taxonomic database containing the scientific names of the genus, species, and higher ranks of many plants, animals and other kingdoms, both living and extinct, within a standardized taxonomic hierarchy, with associated machine-readable information on habitat and extant/fossil status for the majority of entries. The database aspires to provide complete coverage of both accepted and unaccepted genus names across all kingdoms, with a subset only of species names included as a lower priority. In its March 2019 release, IRMNG contained 490,095 genus names, of which 236,514 were listed as "accepted", 120,194 "unaccepted", 7,391 of "other" status i.e. interim unpublished, nomen dubium, nomen nudum, taxon inquirendum or temporary name, and 125,996 as "uncertain". The data originate from a range of print, online and database sources, and are reorganised into a common data structure to support a variety of online queries, generation of individual taxon pages, and bulk data supply to other biodiversity informatics projects. IRMNG content can be queried and displayed freely via the web, and download files of the data down to the taxonomic rank of genus as at specific dates are available in the Darwin Core Archive (DwC-A) format. The data include homonyms, including both available and selected unavailable names. 1 2 "ICTV Taxonomy". International Committee on Taxonomy of Viruses. 2017. Retrieved May 29, 2018. ↑ Sigward, J. D.; Sutton, M. D.; Bennett, K. D. (2018). "How big is a genus? Towards a nomothetic systematics". Zoological Journal of the Linnean Society. 183 (2): 237–252. doi:10.1093/zoolinnean/zlx059. ↑ Gill, F. B.; Slikas, B.; Sheldon, F. H. (2005). "Phylogeny of titmice (Paridae): II. Species relationships based on sequences of the mitochondrial cytochrome-b gene". Auk. 122 (1): 121–143. doi:10.1642/0004-8038(2005)122[0121:POTPIS]2.0.CO;2. 1 2 de la Maza-Benignos, Mauricio; Lozano-Vilano, Ma. de Lourdes; García-Ramírez, María Elena (December 2015). "Response paper: Morphometric article by Mejía et al. 2015 alluding genera Herichthys and Nosferatu displays serious inconsistencies". Neotropical Ichthyology. 13 (4): 673–676. doi:10.1590/1982-0224-20150066. ↑ "Genus". Merriam-Webster Dictionary . Retrieved 2019-03-19. ↑ Harper, Douglas. "genus". Online Etymology Dictionary . ↑ Stuessy, T. F. (2009). Plant Taxonomy: The Systematic Evaluation of Comparative Data (2nd ed.). New York, New York, US: Columbia University Press. p. 42. ISBN 9780231147125. 1 2 D. L. Hawksworth (2010). Terms Used in Bionomenclature: The Naming of Organisms and Plant Communities : Including Terms Used in Botanical, Cultivated Plant, Phylogenetic, Phytosociological, Prokaryote (bacteriological), Virus, and Zoological Nomenclature. GBIF. pp. 1–215. ISBN 978-87-92020-09-3. 1 2 "IRMNG: Interim Register of Marine and Nonmarine Genera". www.irmng.org. Retrieved 2016-11-17. ↑ Rees, Tony; Vandepitte, Leen; Decock, Wim; Vanhoorne, Bart (2017). "IRMNG 2006–2016: 10 Years of a Global Taxonomic Database". Biodiversity Informatics. 12: 1–44. doi:10.17161/bi.v12i0.6522. ↑ Frodin, David G. (2004). "History and concepts of big plant genera". Taxon . 53 (3): 753–776. doi:10.2307/4135449. JSTOR 4135449. ↑ Nicholson, K. E.; Crother, B. I.; Guyer, C.; Savage, J.M. (2012). "It is time for a new classification of anoles (Squamata: Dactyloidae)" (PDF). Zootaxa. 3477: 1–108.